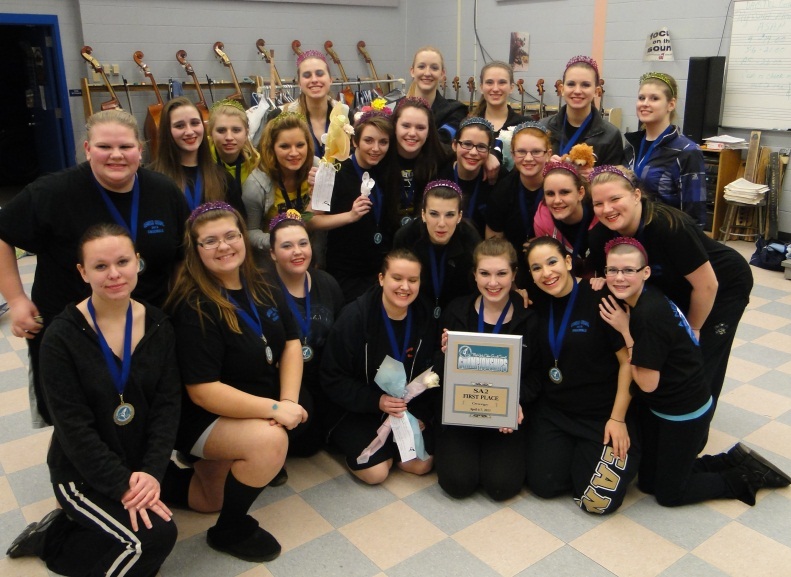 OSWEGO, NY – The Oswego High School Guard finished off an undefeated season at The Mid-York Color Guard Circuit Championships this past weekend at North Syracuse Junior High School. Seniors Elizabeth Westcott, Carly Hewitt, Deanna Santiago display the championship plaque while proudly alongside are Superintendent of Schools Bill Crist, Winter Guard director Michael Tierney and director of bands Scott Ciesla. 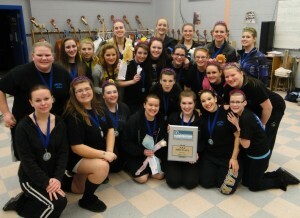 Oswego captured first place in all judging captions with a score of 81.51 to win the title in the Scholastic A2 category. (76.94), Baldwinsville (76.67) and APW (76.15). The guard was led on the floor by seniors Carly Hewitt, Deanna Santiago and Liz Westcott. Other members include Myranda Arnesen, Mikaela Barber, Emily Bradshaw, Katie Bradshaw, Crystal Brooks, Stephanie Cusyck, Danielle Gilbert, Cassie Hondro, Austin Jackson, Cassidy Jones, Marissa Kelly, Cayla Knopp, Cheyenne Malone, Betsy O’Gorman, Katherine Pecora, Kylie Pelky, Brittany Reed, Annie Reynolds, Sarah Reynolds and Ashley Richmond. 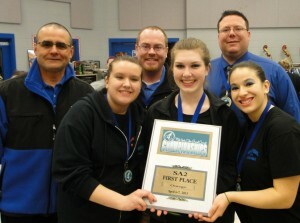 Upon returning to Oswego with the title on Sunday night the Oswego Winter Guard proudly posed with their championship hardware. This year’s show was designed by Ryan Bronner with the choreography created by Alyssa Darrow. Also contributing to the success were flag technician Shannon O’Mara, rifle technician Ali Sivers and graduate assistant Jacqueline Hondro.